Free PDF Image Extractor 4dots is used to extract images from pdf documents and also allows to resize, change image format, color depth, add frame, etc. before extracting images. You can also add text, watermark, rotate&flip, and crop images before starting the images extraction process. Thus, it’s a handy software and is a bit different than other tools to extract images from pdf. 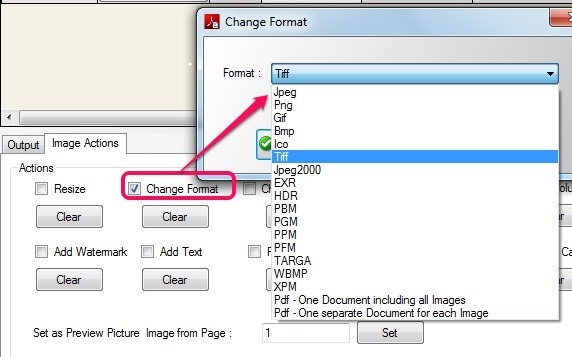 Apart from these actions, you can also set page ranges for a multipage pdf document from which images will be extracted. It’s a feature rich pdf image extractor which is very simple to use. Main interface of Free PDF Image Extractor 4dots is visible in below screenshot where you can add pdf files and can adjust output settings. It is an easy task to extract images from pdf files using this software. But, you need to be careful while downloading and installing this pdf image extractor. Multiple extra tools will be provided during download and installation process. It is helpful to extract all the images present in a pdf file. You can batch add pdf files on its interface and can also add a whole folder containing your pdf documents. Lets you change image size, resolution, add frame, and output format before extracting images. 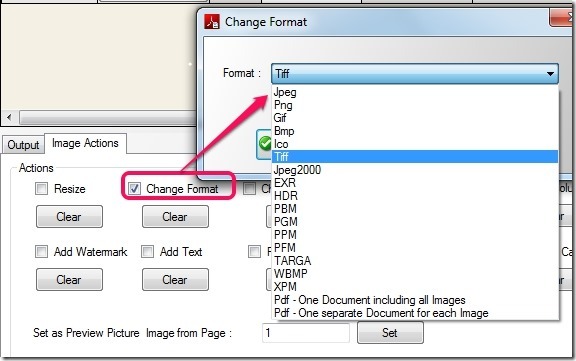 Output image formats available are: tiff, jpeg, gif, bmp, ico, pgm, ppm, xpm, and more. You can also add image watermark, insert text, and can rotate&flip images. Drag n drop support is also available to quickly add Portable Document Format (PDF) files. Facility to extract images from selected page ranges. It also provides option to set preview picture image from a specific page of added pdf file. Anyone can use it free of cost. Note: If you are looking for a software that can extract text from pdf files, then try these 5 free pdf tools. 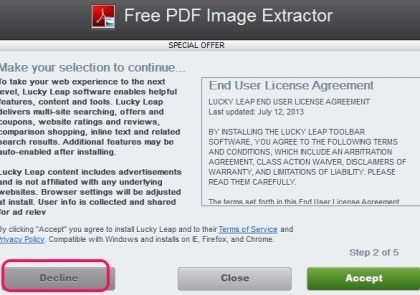 How To Extract Images From PDF Documents Using Free PDF Image Extractor 4dots? 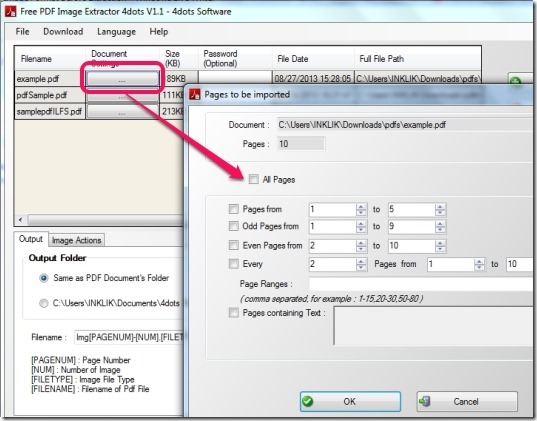 First download and install Free PDF Image Extractor 4dots to PC. It is 28.22 mb in size and you can download it with the help of an installer. Its download link is present at the end of this article. As mentioned above, download and installation process is ad-supported. So extra tools, like LuckyLeap, wajam etc. will be suggested during download and installation wizard. You can ignore these tools by clicking on Decline button and selecting advanced installation option. 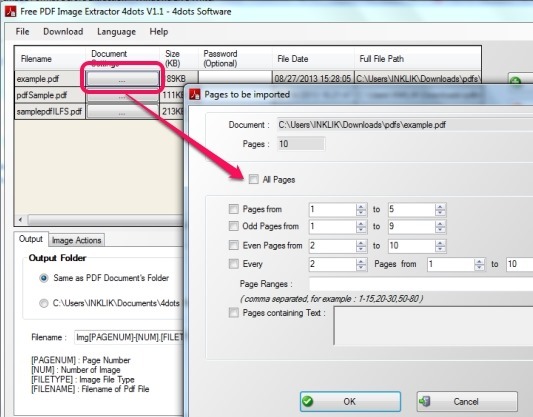 Complete the installation and use desktop icon to open interface of Free PDF Image Extractor 4dots. On its interface, either drag n drop pdf documents or use Add file button to add pdf documents. You can also use Add folder button to add all the pdf files available in a folder. After this, you can tap on Extract Images button to get all the images with default output format and on default destination location. You can select page ranges from a pdf file so that images will extract only from selected pages. To do so, use Document Settings button. It will open a new window, like visible in below screenshot. Here, you can select page ranges, or can also select odd pages/even pages to extract images. You can even take multiple image actions for output images. Use Image Actions tab available on the interface to apply image actions. Multiple image actions can be taken, such as Resize, Change Format, Set Resolution, Add Watermark, Text, Crop, Change Canvas etc. For example, if you want to add watermark (image only), then click on Add Watermark option and a new window will open up. In that window, you can add image from PC and can also select opacity for watermark image. In similar way, to add text on output images, use Add Text option, write text, and extract images with added text. Free PDF Image Extractor 4dots is more than just a simple software to extract images from pdf. A lot of options are present to extract images according to your requirement. You can give a try to this pdf image extractor. Click on link present below to access download page of Free PDF Image Extractor 4dots. Get Free PDF Image Extractor 4dots.